Verdek has extensive experience in deploying highly efficient and integrated microgrids. We specialize in designing and implementing low-cost software solutions that result in efficient operations when your power needs change. Included with our microgrid solution is 24/7 remote energy monitoring and support, allowing you to keep tabs on your available power and usage. Using a cloud-based software called EnergyScope, our microgrid platform is the industry’s most advanced and smart distributed energy resource management system that allows for on-the-go visibility and control. 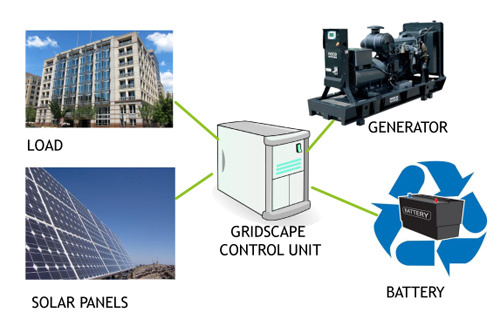 Call us today for a free consultation about a microgrid solution: +1 (888) 336-3734. We provide turnkey solutions based on our GridScape Controller, which determines the lowest cost source of energy available depending on the time of day. Between the solar array, the energy already stored, and the generator, our system reduces energy costs and avoids expensive peak rates.